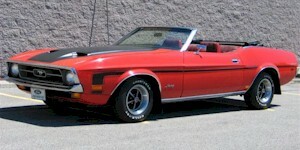 1972 Mustang body design was virtually the same as the 1971 with the same grille choices of a corralled horse with large horizontal bar or the smaller horse logo on the red, white, and blue tri-bar plague. Bumpers could be either Chrome or color-matched to the car. 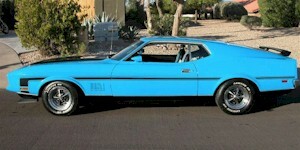 The Boss 351 from the previous year did not return, but the Mach 1 fastback and the Grande hardtop coupe remained. A patriotic "A" package known as the Sprint Decor option appeared midyear which started with a white body, then added light medium-blue paint to the lower perimeter and two blue hood stripes, and had red pin-striping between the white and blue. The Sprint option also had a color matched white and blue seats and carpets, white walled tires, and a 1972 Olympic flag decal on the rear fender. A "B" Sprint package had mag-type wheels. The Sprint option came mainly on the fastbacks and hardtops but a rare 50 convertibles were built for use in the Washington DC, Cherry Day parade. New color glow paint options where also available in 1972 of "Gold Glow" and "Ivy Glow" which was $34 extra. 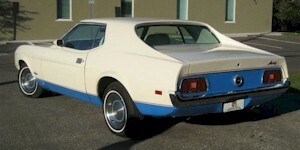 1C-Black was not a standard color for the 1972 Mustang.